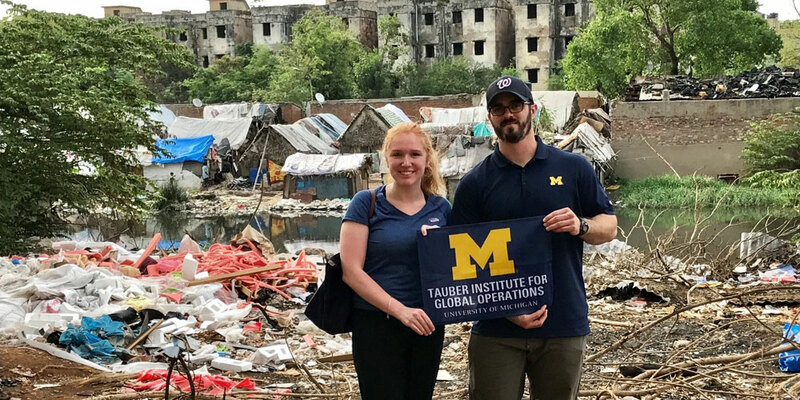 The following is a guest blog from Dell’s ocean plastic supply chain summer interns Allison Ward and Dan Partin, graduate students at the University of Michigan’s Tauber Institute for Global Operations. Most people don’t get excited when they find streets covered in plastic bottles and trash. But that’s exactly how we felt as we embarked on our summer internship. We knew all the statistics from our initial research— the 8 million tons of plastics entering the ocean every year, the growth to 80 million tons by 2025, and the notion that one day there may be more plastic in the ocean than fish. But until we actually saw the piles of discarded plastic and walked the beaches ourselves, it was really hard to imagine the horrific reality. Our summer internship project was to create a supply chain that would help Dell source more ocean bound plastic for its packaging in an environmentally and economically friendly way. We’d do that by extending the supply chain from Haiti to South Asia. It was a daunting task, but through collaboration inside Dell, with external experts, and with the support of the Tauber Institute for Global Operations at the University of Michigan, we proved out a model for Dell that could make an ocean plastic supply chain a reality. Finding ocean plastic was only the first step in the journey. 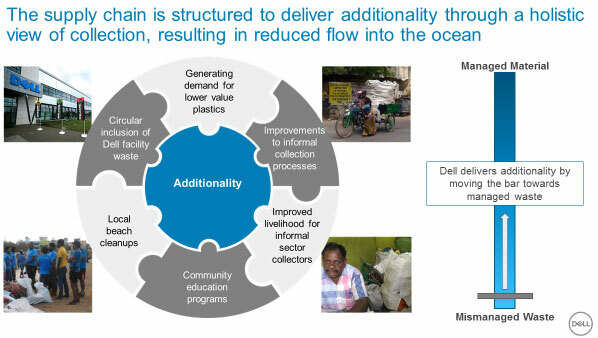 We knew other important supply chain factors must be taken into consideration, such as cost and continuity of supply, but a key focus of our project was to “deliver additionality.” This meant we had to demonstrate that Dell’s intervention would make a positive impact on ocean health that would have not otherwise been created. To do so we created a holistic strategy that would improve the existing waste management structure; targeting the root cause of the problem, not just a symptom. This approach considered the livelihoods and practices of informal sector collectors, local beach clean ups and community outreach programs, and increased demand for low value plastic. The net goal is an improved waste management infrastructure that will result in not only improved communities, but also remove millions of plastic bottles’ worth of material from the ocean. Better yet, we believe the process can be replicated and brought into other regions of the world. In fact, we hope it has to be, as our goal is to someday put ourselves out of the ocean plastics business in each location. The Dell internship experience went above and beyond our expectations. Where else could we say that our project helped create a new type of supply chain with the potential to help thousands of people in coastal cities? We can confidently say that we are changing the world. For more information on internships at Dell, visit jobs.dell.com. Dell | LinkedIn Reveals Its 2019 Top Companies, and We’re One of Them!